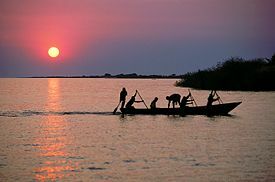 Lake Tanganyika is a large lake in Central Africa that is estimated to be the second largest freshwater lake in the world by volume and the second deepest, in both cases after Lake Baikal in Siberia. It is also the world's longest freshwater lake and one of the world's oldest lakes, having been formed around twenty million years ago. Located at the southern end of the Western Rift Valley, the lake is divided among four countries—Burundi, Democratic Republic of Congo (DRC), Tanzania, and Zambia. The water flows into the Congo River system and ultimately into the Atlantic Ocean. During the slave trading period, it was a major transshipment route for slavers. The old Arab slave-trading town of Ujiji, on the eastern shore of the lake, is where Henry Morton Stanley greeted David Livingstone with the words, "Dr. Livingstone, I presume?" Lake Tanganyika is situated within the Western Rift of the Great Rift Valley that runs from Lebanon to Mozambique and is confined by the mountainous walls of the valley. It is the largest rift lake in Africa and the second largest lake by surface area on the continent. It is the deepest lake in Africa and holds the greatest volume of fresh water. It extends for 410 miles (673 km) in a general north-south direction and averages 50 km in width. Much of the lake's coastline is high escarpment, falling directly into the lake. Since the surface of the lake lies 2,515 feet above sea level and it is 4,710 feet (1,470 m) deep, the lake bottom is 2,195 feet below sea level. The lake covers 32,900 km², with a shoreline of 1,828 km and a mean depth of 570 m and a maximum depth of 1,470 m (4,823 ft) (in the northern basin). It holds an estimated 18,900 km³ (4500 cubic miles). It has an average surface temperature of 25°C and a pH averaging 8.4. Additionally, beneath the 500 meters of water there is approximately 4,500 meters of sediment overlaying the rock floor, leading scientists to estimate its age at twenty million years, though not always in the same shape it is in now. Of the four countries in which it lies, the Democratic Republic of Congo (45 percent) and Tanzania (41 percent) possess the majority of the lake. Its proximity to the Congo's rainforests creates the humid climate. The enormous depth and tropical location of the lake prevent "turnover" of water masses, which means that much of the lower depths of the lake are so-called fossil water and are anoxic (lacking oxygen). The catchment area of the lake covers 231,000 km², with two main rivers flowing into the lake, numerous smaller rivers and streams (due to the steep mountains that keep drainage areas small), and one major outflow, the Lukuga River, which empties into the Congo River drainage. 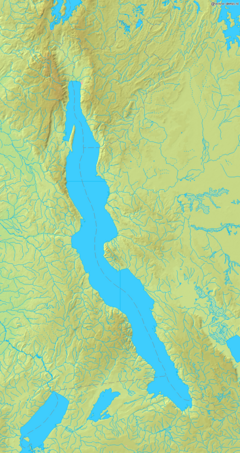 The major inflows are the Ruzizi River, entering the north of the lake from Lake Kivu, and the Malagarasi River, which is Tanzania's second largest river, entering in the east side of Lake Tanganyika. The Malagarasi predates Lake Tanganyika and was formerly continuous with the Congo River. Neolamprologus cylindricus: One of many cichlid fish species of Tanganyika. Lake Tanganyika is home to more than two thousand plant and animal species, and is one of the richest freshwater ecosystems in the world. About six hundred of these species are endemic to the Lake Tanganyika watershed, a result of its long period of isolation. These include brilliantly colored cichlid fish, gastropods with the appearance of marine snails, and so on. Lake Tanganyika is thus an important biological resource for the study of speciation in evolution. The lake holds at least 250 species of cichlids and 150 non-cichlid species, most of which live along the shoreline down to a depth of approximately 600 feet. The largest biomass of fish, however, is in the pelagic zone (open waters) and is dominated by six species—two species of "Tanganyika sardine" and four species of predatory Lates (related to, but not the same as, the Nile Perch that has devastated Lake Victoria cichlids). 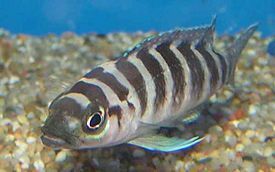 Almost all (98 percent) of the cichlid species are endemic (exclusively native) to the lake and many, such as fish from the brightly colored Tropheus genus, are prized within the aquarium trade. This kind of elevated endemism also occurs among the numerous invertebrates in the lake, especially the mollusks (which possess similar forms to that of many marine mollusks), crabs, shrimps, copepods, jellyfishes, leeches, etc. Other animals found are the hippopotamus and the crocodile. The Gombe Stream National Park and the Mahale Mountains National Park, both on the eastern shore, are famous for their chimpanzees. Gombe Stream is where biologist Jane Goodall did her groundbreaking research. It is estimated that 25–40 percent of the protein in the diet of the one million people living around the lake comes from lake fish. Currently there are around one hundred thousand people directly involved in the fisheries, operating from almost eight hundred sites. The lake is also vital to the estimated ten million people living in the basin. Lake Tanganyika fish can be found throughout East Africa. Commercial fishing began in the mid-1950s and has had an extremely heavy impact on the fish species. Poor farming practices in the surrounding hills coupled with aggressive deforestation has brought heavy amounts of sediment into Lake Tanganyika, smothering its vegetation, which is vital to the fish population. In addition, unregulated large-scale commercial fishing has further depleted the lake’s resources, and catches are shrinking. Former industrial fisheries, which boomed in the 1980s, have subsequently collapsed. Researchers have found multiple lines of evidence showing that increasing air and water temperatures and related factors are shrinking fish and algae populations. Some believe that climate change in the region is harming Lake Tanganyika's ecosystem, decreasing fish stocks by as much as 30 percent over the past eighty years. Researchers measured lake water temperatures, along with air temperatures and wind velocities, and compared data to equivalent records from the past eight decades. Those factors help determine how well water circulates within the lake, a critical factor for the distribution of nutrients that support life in the lake's food chain. Future predictions for this region indicate a roughly 1.5 degree Celsius rise in air temperature, further stabilizing the lake and reducing mixing, with potentially devastating effects on fish stocks. Sport fishing targets include some of the largest fresh water species, such as the Nile Perch, Golden Perch, Goliath Tigerfish, Lake Tanganyika Yellow Belly (Ncupi), and large Vundu Catfish. Two ferries carry passengers and cargo along the eastern shore of the lake—the MV Liemba between Kigoma and Mpulungu and the MV Mwongozo, which runs between Kigoma and Bujumbura. The port town of Kigoma is the railhead for the railway from Dar es Salaam in Tanzania. The port town of Kalemie is the railhead for the DRC rail network. Formed during the upheavals that created the Great Rift Valley twelve million years ago, the African Great Lakes were affected by the ice age of eighteen thousand years ago. The increased aridity caused Lake Victoria to dry up completely, while the shorelines of Lake Tanganyika and Lake Malawi fell at least 400 meters below their present levels. The Ha tribespeople who live at the northern end of the lake today have an oral tradition that they have always lived in the region they call Buha. Therefore, they may have been among the first Bantu groups to arrive from Central Africa, about two thousand years ago. Slaves captured by Arab traders from as far west as the Congo River basin were transported in the nineteenth century across Lake Tanganyika to Ujiji. From there they were marched to the Indian Ocean, a 1,200-kilometer walk that took from three to six months. It has been estimated that during the fifty years that the Omani Arabs controlled the route, over a million East Africans were shipped to the coast this way. The first known Europeans to find the lake were the explorers Richard Burton and John Hanning Speke, in 1858. They located it while searching for the source of the Nile River. Henry Morton Stanley circumnavigated the lake during his trans-continental trip from Zanzibar to the mouth of the Congo River of 1876-1877. The Lake was the scene of two famous battles during World War I. Germany had complete control of the lake in the early stages of the war. When the Allies cut off the railway link in July 1916, the Germans abandoned the area. To avoid their prize ship falling into Allied hands, they scuttled the vessel, which was later resurrected and renamed the MV Liemba. 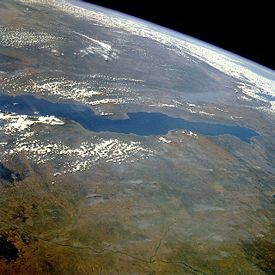 An earthquake along the East African Great Rift Valley fault line struck on December 5, 2005, approximately six miles (ten km) below the surface of Lake Tanganyika. Its estimated magnitude was between 6.3 and 6.8 on the Richter scale. The heaviest damage was sustained by the eastern provinces of the Democratic Republic of Congo, a region already ravaged by extensive war and extreme poverty. The area houses tens of thousands of refugees displaced by conflicts. Dozens of houses collapsed in the DRC city of Kalemie. The quake was centered roughly below Lake Tanganyika and—in addition to the DRC, where the most widespread damage was reported—it was felt in Burundi, Tanzania, Rwanda, and as far away as the capital cities of Kenya and Angola. The lake is hemmed in by mountains that run parallel with its shores. The mountains and the lake are all oriented northwest to southeast along the boundary of the Somalian and Nubian plates. The most dramatic elevation change is beneath the surface of the lake, where Lake Tanganyika plunges to a depth of 1,470 meters. If the geologic forces that created the lake continue, eastern Africa will eventually break away from the rest of Africa and the Great Rift Valley will become ocean. Finke, Jens. 2003. The Rough Guide to Tanzania, 1st ed. This page was last modified on 20 June 2018, at 14:43.